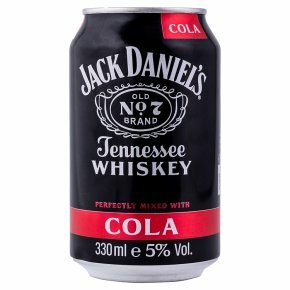 This much-loved pairing (more than 40% of Jack Daniel's is served with cola) comes in this premium pre-mix. The fiery character of Jack Daniel's is mellowed into caramel and sweet liquorice with a creamy vanilla finish. This is superb for parties, easy to pack up and go, and tastes great with mini burger snacks. Sour mash. A perfect mix of whiskey & cola.